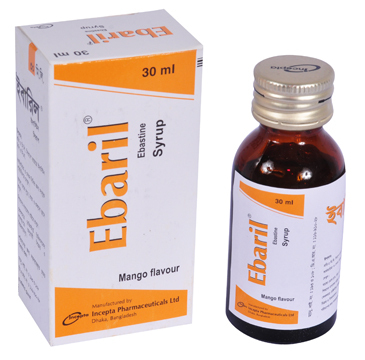 Ebaril 10 tablet: Each film-coated tablet contains Ebastine BP 10 mg.
Ebaril syrup: Each 5 ml syrup contains Ebastine BP 5 mg.
Ebaril is a preparation of Ebastine. 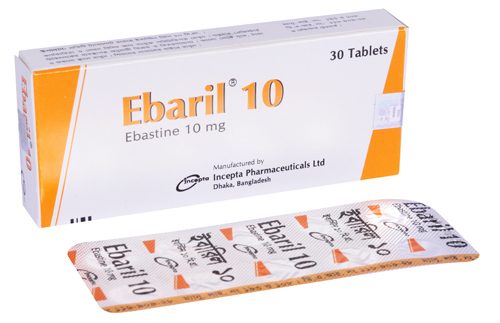 Ebastine is a long-acting and selective H1-histamine receptor antagonist. After repeated administration, inhibition of peripheral receptors remains at a constant level. Ebastine is rapidly absorbed and undergoes extensive first-pass metabolism following oral administration. Ebastine is almost totally converted to the pharmacologically active acid metabolite, Carebastine. • Adults and older children more than 11 years: 10 mg (1 tablet) or 10 ml (two teaspoonfuls) once daily. The most common side-effects are headache, dry mouth and drowsiness. Other less commonly reported side-effects include pharyngitis, abdominal pain, dyspepsia, asthenia, epistaxis, rhinitis, sinusitis, nausea and insomnia. Caution is advised when used in hepatic impairment, renal insufficiency, QTc interval prolongation. The safety of Ebastine during pregnancy and lactation has not been established.